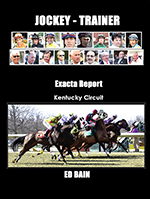 New just completed the 2019 Jockey-Trainer Exacta Report includes statistics through year end 2018. Available now for the New York, Southern California (includes Santa Anita, Del Mar and Las Alamitos), and Golden Gate Circuits. Note: Download purchases require account registration in order to download product.